The Furniture Connexions' summer sale is now on at the Briarhill, Galway, showroom with double discount savings on all King Koil and Myers beds for a very limited time. Customers get double price reductions on these well known bedding brands while stocks last and in addition get up to 10 years warranty on all models. On display at Furniture Connexions, customers will see a wide range of bed brands with excellent quality, comfort, and value for money for every pocket. From open coil to pocket springs, luxurious divan sets to leather and wooden bed frames; it has something to cater to everyone’s needs. With spending up to one third of our lives in bed, seven or eight hours uninterrupted sleep each night is critical to relieve stress, boost mood, physical and mental performance, and cure a wide range of aches and pains. Call in to Furniture Connexions, where certified trained sales staff will endeavour to assist you in choosing the perfect bed for you, ensuring you have the correct information to guarantee a healthy night’s sleep, comfort, and value for money. A visit to see the impressive King Koil and Odearest display at Furniture Connexions is a must this summer and try all the models for yourself to find your perfect match. King Koil is the only bed collection endorsed by the International Chiropractors Association for its special support features designed to improve back and spine care during sleep – welcome news for people with orthopaedic complaints. 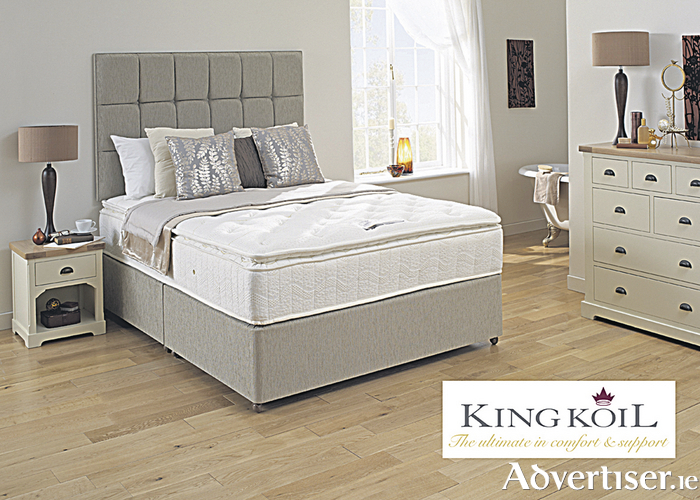 King Koil and Odearest mattresses are available with either traditional reinforced, open-coil springs for those preferring a firmer, more supportive feel, or with luxury pocketed-spring combinations feature the highest quality filling and upholstery materials. Storage drawer options are also available on all divan sets on display. All bases come in a range of fabric colours with matching headboards to complement each bed. During the summer sale, Furniture Connexions is offering free old mattress removal and recycling when you purchase a new one. It also offers free nationwide delivery on all orders over €500. Open 9.30am to 6pm, Monday to Saturday. Closed Sundays and bank holidays. Follow the Furniture Connexions Facebook page to keep up to date with all the latest offers and promotions available during the year. For more information call into Furniture Connexions, Unit 23, Briarhill Business Park, Ballybrit, Galway or phone 091 709550.